I had learnt from The French Wench, that most places in Sydney don’t serve freshly shucked oysters. When oysters are fresh, a drizzle of lemon is enough to cause them to shrivel and move. Click here to see her post. Based on this key finding, I insisted we order the oysters for this very spectacle. I wonder what that must feel like for them? Surely it must be painful? How exciting! So with oysters in check, lemon in hand, I went for the squeeze and I didn’t even so much as get a wriggle. Not even the slightest sign of movement. Sigh. I had specifically come here to see them shrivel. Well at least I didn’t put them through any pain, which is a shame. Lifeless oysters aside, they were simply scrum-dili-umptious. We asked for 6 oysters from two different regions and instead received one from each region of Australia. They all tasted very lovely though. I just don’t know which ones I tasted. Either way, you can’t go wrong. I am such a sucker for steak tartare I simply couldn’t go past it without a taste. It arrived with a plump egg yolk that was ready to burst. It was so big! I just love, love, love the process of grabbing my fork, forcibly breaking the seal, unleashing the yolk while I watch the slow graceful yolky waves wash over. 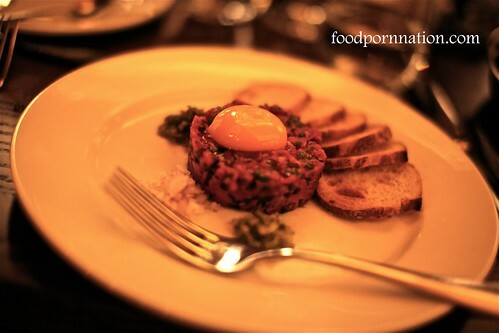 The steak tartare was indeed another good start to the night. The crunchy bread croutons were a perfect contrast in textures with the gooey moist meat spread along a crunchy dry bread biscuit. 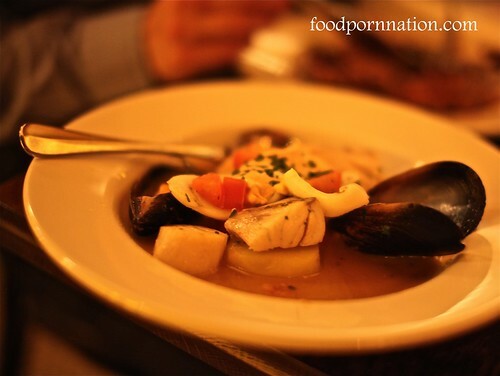 Julia and I ordered the Bouillabaisse from the Plat de Jour (available only on Tuesdays), where it was filled with chunks of seafood lightly submersed in a seafood broth. The whole dish was topped with the most delicious rouille I have ever tasted. Oh my god! I kept trying to save it as I could see it slipping and disintegrating away into the liquid broth. The meal became like a strategic game of chess where I had to think three moves ahead, so I wouldn’t so much as loose anymore of the rouille than I was already loosing due to the sheer force of gravity. The rouille brought the entire dish together and gave a creamy tangy finish and lift that took the dish from good to great. Brazil had the duck confit and he said it was one of the better duck confits that he has tasted. It delivered a lovely crispy finish on the skin with a tasty side of red grapes, walnut, frisee and radicchio. Brazil completely cleaned the plate, which is funny because he doesn’t even eat fruit. In fact he despises it and I didn’t even tell him about it! I finally made him eat fruit! The fact he ate the grapes is quite groundbreaking, albeit without his knowledge, still remains a sincere testament to the quality of this dish. 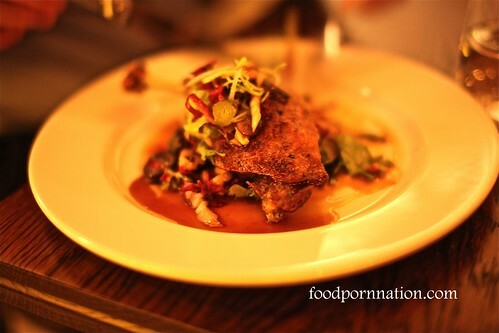 Overall, the meal was delicious, the scene was buzzy and staff were friendly. The only drawback was the acoustics, it was almost harrowing, reverberating at 100 decibels higher than the legal limit. Well that’s what it felt like. So not the most ideal setting when you are after an intimate meal or for a good old chat amongst friends, which is what you tend to do when you eat out. Get intimate and chat. If you want to get around this just aim for the outdoor area, you will be doing your ears a favour. Welcome to Felix Bistro, homage to fine French Brassiere eating. Sounds absolutely wonderful. I will have to give this place a try when I am in Sydney. Absolutely! I already have a list of places that I HAVE to take u to! Exactly TFW! It’s all about how good it tastes! Jamie’s Italian – Is Jamie’s pukka tukka worth the wait?